You can easily integrate Google Analytics UTM tags in Email Campaign Templates and can track the clicks on you email from email subscribers. 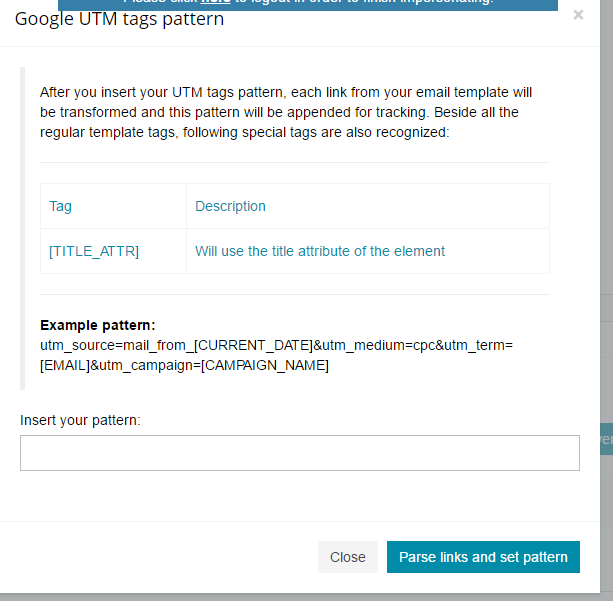 To integrate Google Analytics UTM Tags in Email Campaign, at email template screen, click on “Google UTM Tags” Button which appear below the email editor box. Inside the pop-up, after you insert your UTM tags pattern, each link from your email template will be transformed and this pattern will be appended for tracking. After you have entered the pattern correctly, click “Parse links and set patters” button. This will automatically update all you outgoing links.